Reconstruction of heritage has risen to the top of priorities in the world of development post- earthquake. 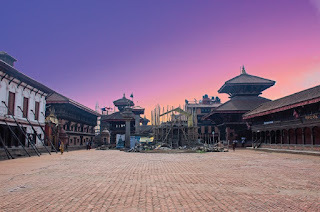 Even as the aftershocks continued to hit after the 2015 earthquake, I remember the first and primary concern for most people in Kathmandu was for the Dharahara, the Kathmandu Durbar Square, the historic city of Patan, and other material architectural heritage. People could be united around these monuments and feel their loss in a way they couldn’t for those 400,000 who lost their mud-thatched huts and stone cottages. I couldn’t help thinking how polite the Nepalis are, always—he had just saved the lives of a group of travelers, and yet his concern was still with whether he’d been too forceful with his speech. He had physically picked up a woman from Singapore, one of the trekkers in his group, and run all the way to Dhunche, because “I realized she would not be able to make it.” The rivers are full of dead bodies, he said, and we looked at each other in silence. For the first time I got a keyhole glimpse to the magnitude of what had happened. Of course, I was in the B and B Hospital, where the doctors had to forcibly lock the gates after too many injured and dying people started to block the corridors and the stairways, so I knew things were bad. In the midst of all these chaos and unaccounted deaths, the only way for people to do something was to focus on those beloved monuments and landmarks, which became icons representative of all that was lost. 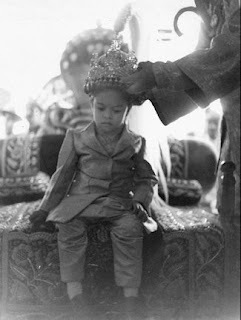 On the day my young friend visited me, he had just come from cleaning up the Kathmandu Durbar Square. In the midst of all that horror, I could not help admiring the serious, conversational way in which he told me all this, as if we were sitting there chatting in his house’s threshold in the village, and how fresh and clean he looked, and the way his smile never wavered, as if he hadn’t seen horrors of the Earth opening up. While these iconic monuments and historic sites definitely deserve to be rebuilt, and rebuilt with proper seismic standards, I am struck by how blank the knowledge of those who propose to support these reconstructions can be. Nepal is replete with brick and mortar buildings, which layer its outward cities, and those are visible to the outer eye. But, the architecture often rests upon intangible heritage like jyotishis preparing auspicious times and charts, priests conducting secret tantric goddess worship, and everyday folks sharing oral narratives about demons and ghosts. Myths, legends, and family histories that may or may not have been transliterated into a textual source are woven into the architecture and are invisible to the causal outsider. How can Kathmandu be rebuilt by banks in Germany if they do not take the traditional knowledge of Bhaktapur locals into account? What can bankers know about the intersecting knowledge required to create brick and mortar, stone and wood carving, pottery and bronze? But, most importantly, what do they know of the intangible heritage that triggered these monuments in the first place, the goddesses and the deities that populate the rafters and the foundations of these very old structures? How many experts who flew in recently to rebuild Kathmandu know about Jamuna Gubaju, Nepal’s greatest tantrik, who became annoyed with the Indian who came in boasting about how he was the greatest tantrik, and one day invited him over to his house—only to see Gubaju’s wife using her legs as firewood to cook her rice? There she is, with her feet stuck inside the firewood stove, busily cooking her rice. The Indian tantrik was terrified, admitted defeat, and retreated. (Note: This story is excerpted from a much later one, to be saved for a later date.) What do the heritage re-constructionists know about all this—and how are they going to fit all this within their neat engineering solutions to Kathmandu Valley’s revival? But this story is very much part of Kathmandu’s inner lore, and very much part of the woof and warp of what makes up the architecture. The smoky rafters in the attic, where the female tantrik cooked up her calm kitchen revenge, the buigal, or attics, where such events occur, the narrow wooden staircases that lead up to the room, the smell of burning flesh and the smell of cooking rice, this is all part of the intangibles that creates the city. But, start talking about the tantrik, or how Hinduism, astrology, tantricism, and animism are the foundations of architecture in Nepal, and you would be pegged as an amusing eccentric with nothing tangible to say in international development circles. “Traditional knowledge” today means training a few village women how to rebuild a basic building. You can check the gender equality box and the cultural sensitivity box, and continue onwards with the work. The work that is done in this manner is no longer religious work, or spiritual work, or community work—it is development work, and development work almost always crumbles into nothingness once the project phases out. Astrologers not only picked the dates for when a building could commence being built, but could also advice on which direction the building was to face, depending upon the owner’s personal chart and vastu alignments. For a country that is still deeply immersed in cycles of festivals in which the waxing and the waning of the moon, and the change of the seasons, play a major role in timing, the astrologer and his patro (thepanchang) was often of vital importance in setting dates. Because building is a communal activity, it was advisable to avoid those months in which sowing and planting take place—a commonsense planning benchmark that most modern builders overlook. A lot of complaining about Nepali workers and their unreliability (“My workers have all suddenly left to go back to the village, and I don’t know when they will be back. Nepalis are so unreliable!”) could be solved with a little judicious foresight of local festivities. 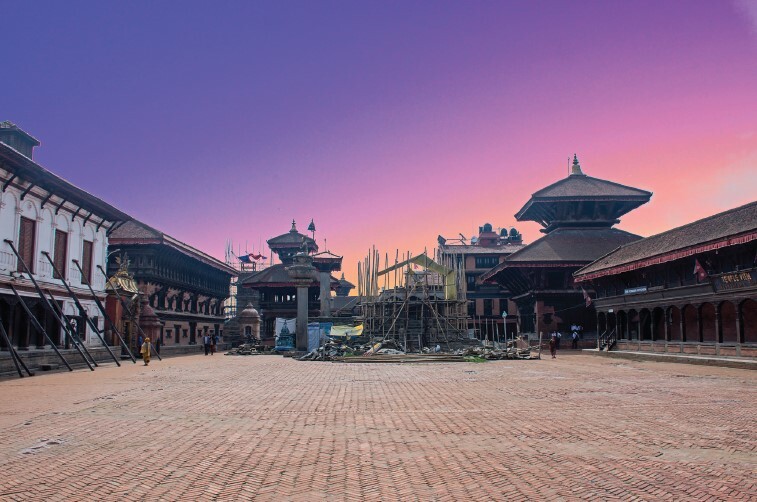 What is remarkable about Nepal’s traditional heritage was not just the beauty of its buildings, but also the way in which they aligned together to form squares and intersections, temples, and water tanks. All of these then came together to form coherent towns and settlements with a central core, where a temple complex, or a water body, played a central part. Unlike today, when houses are built haphazardly, following no rules of community in their alignment—with some facing to the back, and some to the front, some to the left, and some to the right, all apparently fighting to rise higher than the next in the same few square meters of space—buildings in those days respected rules of height, coherence in building style and materials, and spatial alignment, not just because the king commanded it, but because the astrologer said so. The Ranas made equally beautiful palaces modeled on Italian renaissance architecture, formal in structure, with courtyards, gardens, and fountains. In fact, some have argued the Shah monarchy were the least precise and demanding in their architecture, with the Narayanhiti Palace characterized a dumpy eyesore by one disgruntled observer. Often, these ancient settlements and towns resulted in what to our eyes now look like beautiful urban planning, with a logic and coherence which eludes us in post-modern, republican times. Temples were also built in the form of mandalas, which assigned different deities to different corners. If reduced to 2D, they would be complex diagrams that map out space and time and other elements in their internal blueprints. Often, these symmetrical alignments had to be strictly adhered to, in order not to disturb the deities who lived in these structures—and the symmetry of which also imbued the building with seismic strength. A book I read about temple-building mentions how the interlocking wooden frame allowed the building to sway during earthquakes. I assume the grinning skull bricks that line temples also act to protect against earthquakes by creating a tensile line of strength, in much the same way as the modern method of building a horizontal band that breaks up the t-wave. Again, there were a lot of do’s and don’ts in the old methods of building that had to be strictly adhered to, and the knowledge of which has now been lost in the modern moment of concrete-and-iron rod supremacy. The weariness with the old rules and regulations made us think we could do without them—only until the next earthquake, in which structures that had adhered to the old school of thought survive, and will probably do so for the next several hundred years. Concrete and iron rods are, of course, the preferred modes of building now, because they are perceived to be safer and more reliable than old methods. But, as we degrade our river beds in the search for more and more construction materials, we have to rethink how long this free-for-all exploitation of natural resources can continue for building cities that, at the max, have a lifespan of a century. Concrete, I am told, ages fast and doesn’t last beyond 70 years. And, when a concrete building collapses, it collapses suddenly. I was interested to learn from architect Kai Weise, who posted about this on Facebook, that the chariots used in jatra festivals functioned as a “shake table”. Builders rebuilt the chariots each year, each time testing strength and reliability of their design and structure for seismic performance. We often think of jatras as amusing spectacles with splendidly useless structures like the Machindranath chariot being wheeled through crowded cities, and we forget they may have vital utilitarian purposes. And, once the aftershocks receded, leaving people with debris and death to deal with, the jatras became deeply emotive locus points of survival and reconstruction. How could all of this intertwined heritage be separated into the good versus the bad? How can buildings be reconstructed if the astrologers, priests, storytellers, musicians, butchers, and tailors are not included? How can those who tie the wheels of the chariot at a jatra, or paint those eyes on it, not be asked to a meeting with international development consultants about how to reconstruct their city? Which is why I feel a certain level of unmistakable joy that the Bhaktapur residents rejected the German bank’s offer. The money may have been large, but at the end of the day, it is also about preserving the intangibles—the Hindu philosophy, the tantric practices, the farming culture—all of which would have been lost if the living, breathing buildings had merely been reduced to picturesque architectural edifices with potential to draw large numbers of tourists. After seeing the destruction of Rani Pokhari, which has now become a dry plot which the powers-that-be hope will dry up enough to re-build as a giant concrete supermarket, it is natural for all of us to wonder: “Can the Nepalis save themselves?” Can the Nepalis hold on to their heritage? Or, are we doomed to watch it all collapse and crumble before our eyes as an enforced secularism tries to erase, asphalt over, and sell the last lingering bits of religious piety and devotion? If we can’t even reconstruct our one last remaining water body in the middle of the dense, overpopulated, water-scarce urban core, what can we do? Rani Pokhari is the only open water body that can recharge the groundwater in the areas around Ason and Indrachowk. The thought occurs to me that nagas, thought to live in the watery depths, and once worshipped devoutly by Hindus, get angry when their habitats are disrespected. Water wells are always cleaned on a certain date in Newari households, because they don’t want the nagas to be angry. What happens when powerful beings that dwell in the depths of the Earth start to get furious? Do earthquakes result from water being disrupted? Do nagas take revenge on puny humans and make the earth split open? Do we need to revive our myths to revive our water ponds and rivers? Behind our most charming mythologies lies serious science: environmentally-sound water recharge and management strategies, shake tables, collective trauma therapy. Sanskrit mantras that are memorized and enunciated syllable by syllable, and chanted at the right speed, help to thicken a part of your brain that retains memories, says a recent research by neuroscientist James Hartzell, who has dubbed it, “The Sanskrit Effect.” We are willing to put millions of dollars in Alzeimer’s research (with no treatment in sight) but we won’t encourage people in this poor country to take up this simple, powerful, and scientifically proven remedy that comes from the heritage that their ancestors left them. Whatever the politically correct politics behind this, the point remains: when we lose our mythologies, we lose the balance of our lives. Perhaps there may be a middle point where all these intersections meet—finance, religion, spirituality, culture—but if the process of rebuilding brings bankers and development consultants to the center of this process, and sidelines the gods, goddesses, and nagas, the process no longer makes sense. At the end of the day, the woof and the warp of religious, spiritual, and communal life must always take precedence over neo-liberal capitalism. Sushma Joshi is a writer and filmmaker from Kathmandu, Nepal. She has an MA in cultural anthropology from The New School for Social Research in New York.